There are many TV installation choices in and around the greater San Diego area. Some installers advertise low prices that are attention grabbing and seem too good to be true. Often this base price is just that, a price designed to get your attention. Metal studs or concrete? Extra charge. 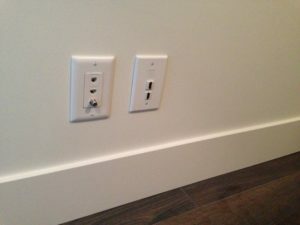 Cables in the wall? Extra charge. You live 1 mile outside their preferred travel radius? Extra charge. The list goes on and on. 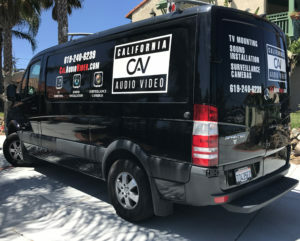 With California Audio Video Inc. you get the best possible service for one fair, guaranteed price. Clean, cable-free installations is what we are known for. We approach ever install as if it were our own place. If there are any optimizations or any way we can make your audio video setup look or sound as good as possible we will achieve this. We always go the extra mile we want our customer’s to have an A/V setup they can be proud of and brag to friends and family about. We want our work to speak for itself. We laser level everything we install to the exact degree. All our HDMI, optical and other A/V cables are in wall rated for use within your walls. We finish all our installations off with decora style wall plates for a clean, finished look. We always match our wall plates to the color of your existing electrical and light switch covers for the ultimate finish. 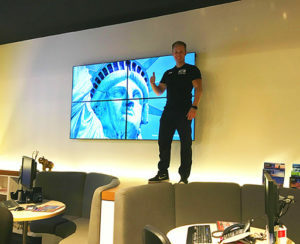 We tie and dress all wiring from the wall to all your components and TV for the ultimate custom installation experience. No messy wires ANYWHERE! Once you see our caliber of work, attention to detail and our fit and finish those bargain installations no longer seem like a bargain at all. In fact, we are often called into to optimize and clean up after “discount” installers. Why pay twice? 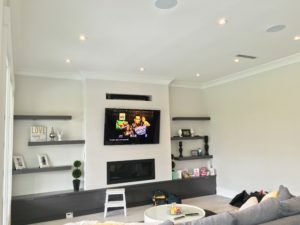 Have CAV do you TV mounting, home theater or surveillance camera system the right way the first time around.